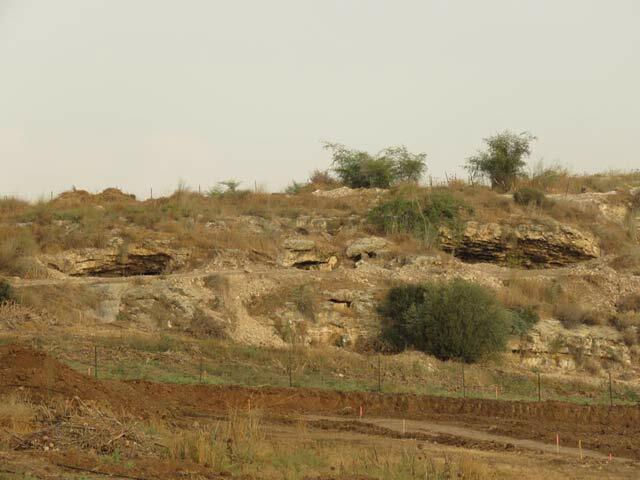 In August 2017, a salvage excavation was conducted to the south of the Nesher Quarry in Ramla (Permit No. A-8086; map ref. 192970/645660; Fig. 1) as part of the Nahal Ayyalon diversion project. The excavation, undertaken on behalf of the Israel Antiquities Authority and financed by Nesher Israel Cement Enterprises Ltd., was directed by M. Oron (field photography and drafting) with the assistance of Y. Amrani and E. Bachar (administration), M. Kahan (surveying), I. Taxel (ceramic finds), I. Lidsky-Reznikov (pottery drawing), L. Rauchberger (tobacco-pipe identification), C. Amit (studio photography) and A. ‘Azab. The openings of several natural caves were identified along a cliff line of hard Bi‘na Formation limestone. The cliff runs along a roughly north–south axis, with the cave openings facing east. Two caves, the northern and southern ones, were excavated, and the opening of a third cave, which seemed to lead to a cavity connected to the northern cave (Figs. 2, 3), was examined with mechanical equipment; no finds were recovered from this investigation. 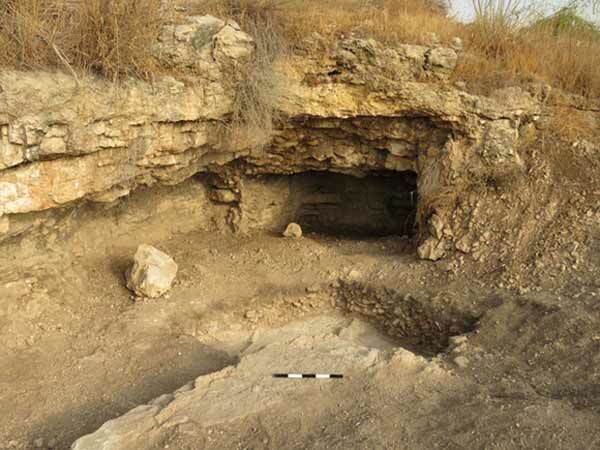 The northern cave yielded remains attesting to its use in the Ottoman period, as well as a few potsherds and flint items that indicate more ancient human activity in the vicinity. 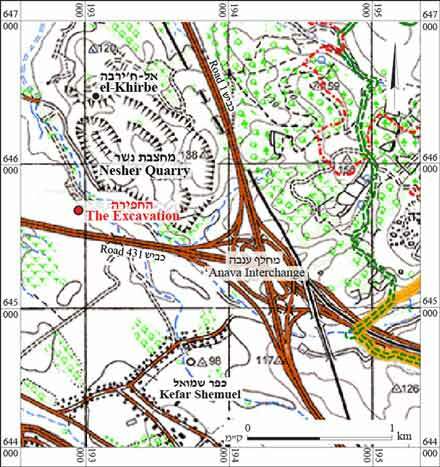 The excavation was located to the south of the site of el-Khirba on the north side of the Nesher Quarry, where settlement remains from the prehistoric to the Byzantine periods have been discovered, and west of the city of Ramla, which has been inhabited intermittently from the eighth century CE to the present day (Tendler 2015). The Northern Cave was relatively large (c. 16 m across at the entrance, c. 12 m deep; Fig. 4). 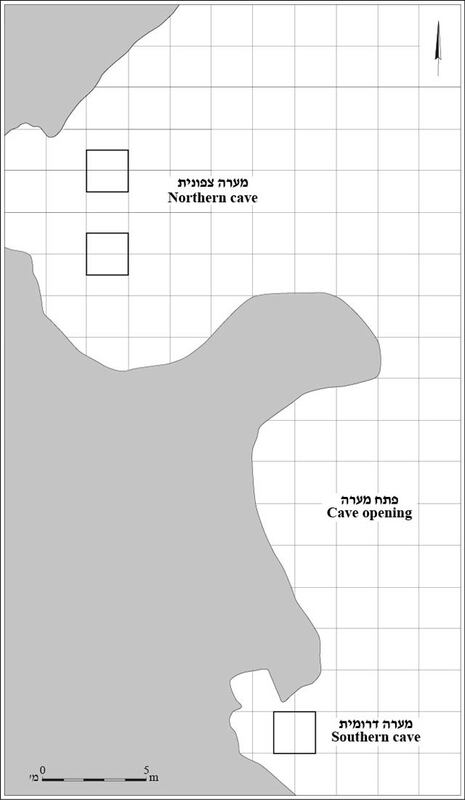 Two probes were dug inside the cave: in the center and at its northern end. A layer of brown soil, animal dung and ash containing potsherds from the Ottoman period mixed with modern finds: two bowls, one of Gaza Ware (Fig. 5:1) and the other probably earlier (Fig. 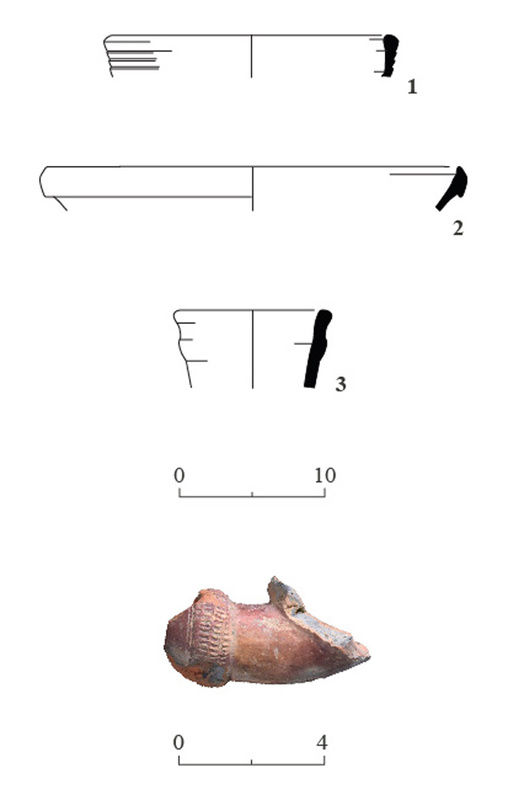 5:2), and a tobacco-pipe fragment (Fig. 5:4) from the late nineteenth – early twentieth century CE, when the cave was probably frequented by shepherds. Below this level was a layer of soil (c. 1 m thick) containing stones that had collapsed from the cave’s ceiling. A few potsherds, including a jar (Fig. 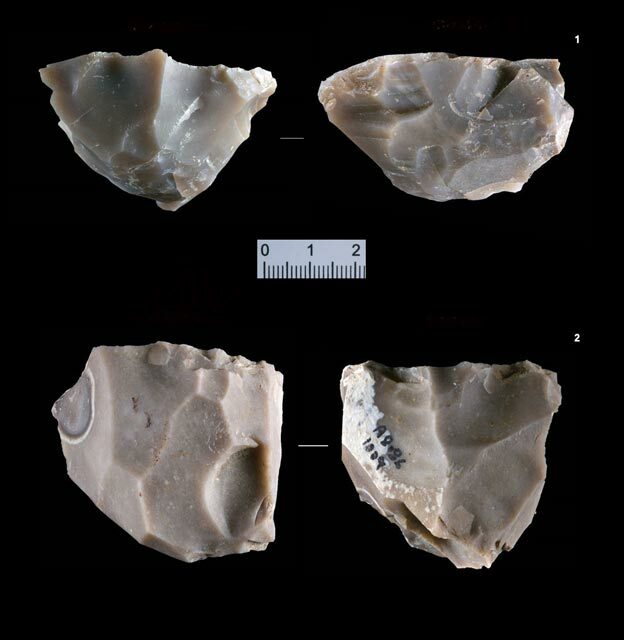 5:3) from the Mamluk and early Ottoman periods, as well as non-diagnostic flint artifacts, among them flake cores (Fig. 6:1, 2), were found in this stratum. Mechanical equipment was employed to dig down to the bedrock, but no other finds were discovered. The Southern Cave is relatively small (c. 6 m across at the entrance, c. 5 m deep; Fig. 7), although it was obviously larger in the past, before it collapsed. Collapsed rocks from the roof were cleared with mechanical equipment, exposing a level of brown soil containing non-diagnostic potsherds. Below this level was an accumulation of soil and additional collapsed rocks from the roof (c. 0.5 m thick), which covered the bedrock. 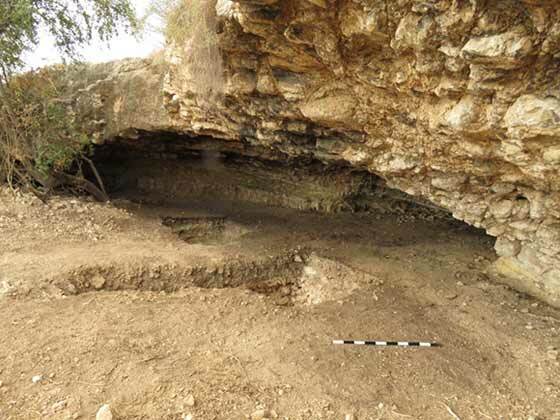 The caves were probably used during the Ottoman period or even as early as the late Mamluk period, possibly as a shelter for shepherds from the city of Ramla and the nearby villages. The flint items may indicate an earlier use of the caves, but they are not indicative and were not found in situ. Tendler A.S. 2015. Ramla, Nesher Quarries. HA-ESI 127. 3. Cave entrances, looking west. 4. North cave, looking southwest. 7. South cave, looking northwest.